Trader Joe is a genius. I’ve been hammering Trader Joe’s pumpkin-flavored frozen treats hard recently. We looked at TJ’s Pumpkin Ice Cream, we’ve looked at their (even more delicious?) mini pumpkin and ginger ice cream sandwiches, surely you’re thinking we’ve got nowhere to go from here. 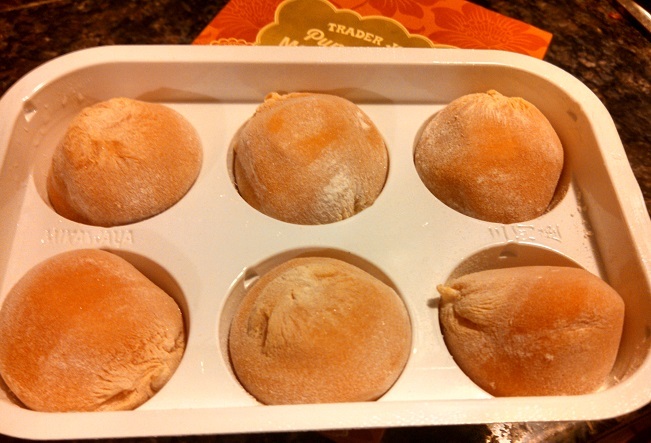 What it is: Pumpkin ice cream balls, wrapped in tender mochi. Worth it: Yes. These are awesome! That’s where you’re wrong, friend, because I’ve saved the best for last, with Trader Joe’s Pumpkin Pie Mochi Ice Cream. Just go out and buy some right now and then eat them in your car. Frequently commenter Mara revealed recently that Trader Joe’s mini pumpkin ice cream sandwiches winked at her so delectably that she had to eat the entire box in the parking lot. This is an activity I understand all too well. What I’m saying to you now is, when it comes to Trader Joe’s Pumpkin Pie Mochi Ice Cream that’s not even optional. In all seriousness I want to open the box up, in your car or on the bus or while roaring down the road on your ‘roided up hog, and pop one in your mouth. Don’t even wait, just do it. What Trader Joe’s has done is taken their delightful pumpkin ice cream to the next level. Any ice cream is improved by enclosing it soft mochi, but TJ’s pumpkin pie ice cream – with it’s warm, delightful notes of cinnamon and nutmeg – really becomes something amazing. Mochi, for those who may not be familiar, is a traditionally Japanese food. What it is, literally, is rice. Cooked rice that has been pounded over and over again until it forms into the sticky, chewy, malleable and unspeakably tender blob called mochi. In Japan it’s closely associated with festivals and big holidays, and is used in all sorts of sweets or just eaten by itself. The masterstroke of mochi, though, is in using it to hold little pockets of ice cream. A thin layer of soft, gently floured mochi (to prevent sticking) is wrapped around a good sized scoop of ice cream. As a result, you can hold it directly in your hand without worrying about it melting, while also enjoying the pleasant chewiness of the mochi-ice cream combo. It is, essentially, the Japanese take on the ice cream sandwich – only better. Most Trader Joes’ carry the Mikawaya brand of mochi ice cream in a variety of common flavors (vanilla, strawberry, and green tea). 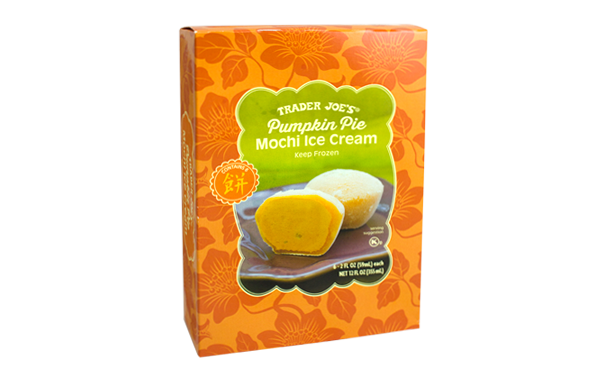 Only Trader Joe’s, however, offers something as crazy as Pumpkin Pie Mochi. Surprisingly, TJ’s doesn’t just use their premium pumpkin ice cream in these mochi, but instead has formulated a slightly different version (referred to in the name, as you may have noticed, as pumpkin pie ice cream). The main difference seems to be that the mochi ice cream freezes harder than the notoriously soft pumpkin ice cream, although I’d swear that the pumpkin pie ice cream actually tastes a little more pumpkin-y than the pumpkin ice cream itself. (This is another instance of a weird quirk at TJ’s where offshoot products sometimes taste more authentic than the progenitor product. Cf. TJ’s Sriracha hot sauce vs. TJ’s Sriracah Ranch) It’s also worth noting that they got the fat content under control in these mochi bites – only 20 calories from fat per ball. In any case, you can’t go wrong with these. If you’ve never had mochi ice cream before, do yourself a favor and pick one up. If you have had mochi ice cream before, you’ll want to add these to your arsenal. Of all the pumpkin products I’ve had at TJ’s this October, these mochi balls might be the most surprising and delicious. By the way, one last tip – if you’ve never tried it, leave one of these out for a few minutes to melt slightly. The mochi will safely keep all the ice cream inside. Taking a bite of a partially melted ball that’s approaching room temperature is a heavenly experience. Would I Recommend Them: Yes, a great combination of chewy and chilly. Would I Buy Them Again: Yes, I’ll be crushed if they don’t have them again next year. Final Synopsis: Mochi improves any ice cream. Okay, so I just ate one. For me, these are good, but resistible. There must be something about the ginger/spicy/salty/sweet orchestral crescendo in my mouth of the Pumpkin Ice Cream Mouthfuls that just did me in.